We wanted a new campground, new to us, new to you, and breathtaking and all that goes with that. And did we ever get it! We aced a site at Como Lake Campground near Darby, MT. This place has power and water for a measly $16 a night! And sites you can move around in and not touch your neighbours. Because the reservation season is closed there was no problem driving in and picking a site, but even better for us was the site we preferred the most was available when we arrived. Yes we like boondocking, yes we have enough water that we don't need hook-us, etc. but in the mountains in the fall the power is nice. When the sun has set and the chill hits the air, it is quite comfortable to sit n the Fifth Wheel, in our recliners, in front of the fireplace. This year they are having water problems and hence it was not potable, but that was the only downside. Now although I said this is the best site and we loved it soooo much, the first thing we did after setting up was drive a bit further, well actually a lot further, south. To check out other campgrounds. We have a bizarre compulsion. The only thing we got out of this day trip was the opportunity to see the wonderful town of Salmon. And then a stop at a used book store in Darby. Now this was something to see. The Friends of the Library operate a used bookstore on Main Street. All the books come from either donations to the library, or the books that are being retired. They make enough income to cover the cost of the building space and upkeep, and it is ran by volunteers. The cost of the books is a donation to the library. Being a lifetime supporter of both libraries and "Friends of Library" groups, I didn't get out of there empty handed but it was so affordable. The clerk was a wealth of information as well, which is often the case in smaller communities. After we had a lazy dinner we went for a stroll around the campground. It is not unlike us to befriend someone and have a visit. In fact that is one of the most enjoyable parts of our travels, is meeting other RVer's and sharing stories. This time we shared some great conversation with Dorothy and Andy from Massachusetts. They have the greatest story - their long time companion Roxie recently passed away and to find some healing time they purchased a motorhome and set off. In honor of their furry friend the RV is named Roxie 2. We passed a couple of hours around their fire that evening, and knew there would be more to come before the jacks were pulled and we both moved on. Ever restless we seem to be, so the next 2 days saw us out in the Dodge, seeking adventure. On Thursday we decided to seek out Painted Rock State Park, just to ensure we weren't missing out on anything. If I said we couldn't determine where a painted rock was and there was not one person camping in the area, would you understand that we missed nothing? I realize I make these types of statements a lot, so you must understand that it is in no way a refection of how our day has gone. I have told you before our best days are usually spent exploring places and seeing new scenery, and this was no different. You don't know until you go! Friday saw us taking a road marked "Wildlife Viewing 26 Miles". Now that sounds nice doesn't it? Again lunches are packed and we are off to see the great unknown. And the greatest adventures await when you are greeted with a road sign that says "Steep winding mountain roads - no vehicles pulling trailers over 20 feet". In our travels these are traditionally also noted on road maps as "Scenic Drives". 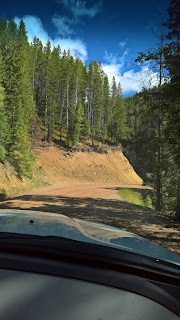 This was Highway 38 in Idaho, and according to the paper maps we had, it might lead us to a town called Phillipsburg, MT. Why not, right? Now get this - the road Skalkaho Highway, leads to Skalkaho Falls and follows the Skalkaho River. It doesn't get more creative than that. In the words of CW McCalls song Black Bear Road, it looks like a bunch of Z's and W's strung together. And to use the term highway?? Very very loosely!! The road and the falls... My pictures don't seem to capture it that well, but it was breathtaking! Finally in Philipsburg, MT. We were driving down the street looking for a place to stop and I spotted Boheme Coffee on the corner. I yelled stop, Don complied, and we enjoyed a great lunch, coffee and some free WiFi. Don and I then went separate ways. He wanted to photograph some of the buildings in town. We have visited a lot of historic mining towns, but this is one of those places where you can see the care that still goes into each building, and the authenticity of each historic entity. A great place to visit - highly recommended! My intention was to leisurely shop (surprise) but I got caught up in a long conversation with the owner of a pottery store. This stay at Como Lake has been so much fun, I need to save part 2 for another day. Come back!